» nail tutorial: acid washed denim. » look at how they shine for you. » nail tutorial: EYEBALLS FOR BREAKFAST. » review: bps color changing mood polish. » review: revlon colorstay base coat. » nail tutorial: loose bones. 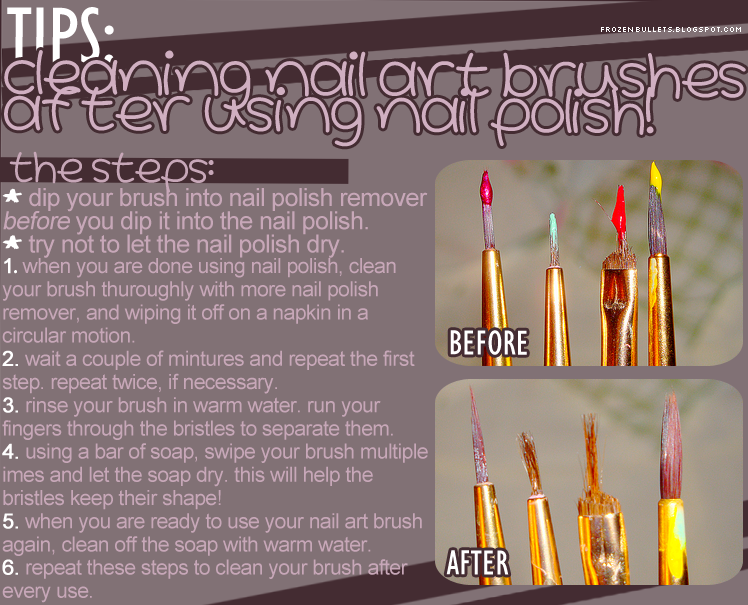 tips: cleaning nail art brushes after using nail polish! in the world of nail art, many intricate design require the use of a nail art brush, striping brushes included. i have searched the world for a perfect way to clean my brushes, but i have yet to find the tutorial that would aid me in my nail art adventure. they either don't work, or they work, but they still leave my brushes a little stiff due to the dry polish. but alas! i have used a combination of multiple tutorials that i have seen and i have created my own method! this method works perfectly for me, and i hope it works for you too! also, how do you like the tutorial layout? i actually made an attempt to make it look nice and opened up photoshop!